Following on from my last update, I’ve spent a fair bit of time experimenting with two very different ADS-B aerial configurations. I have two Raspberry Pi3s, both running identical software and exactly the same receivers, the FlightAware Pro Stick Plus which is a version of the RTL-SDR dongle with a built in preamplifier and bandpass filter. This may (or may not) be as good as the other dongle I own combined with the Uputronics preamplifier/filter but I wanted both setups to be identical. 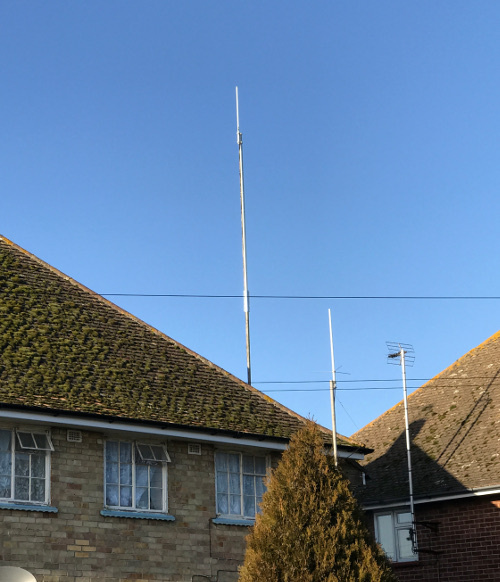 My first station is using a commercial aerial, a Moonraker “Radar-110” 1090 MHz collinear base antenna mounted on the side of the house, 38ft above the ground and in the clear. Between the aerial and the receiver is approximately 15m of ExoFlex 15 coaxial cable which I calculate will give about 1.4dB loss at 1090 MHz. The receiver is connected directly to the bottom of the coax with the Raspberry Pi attached directly to the receiver. 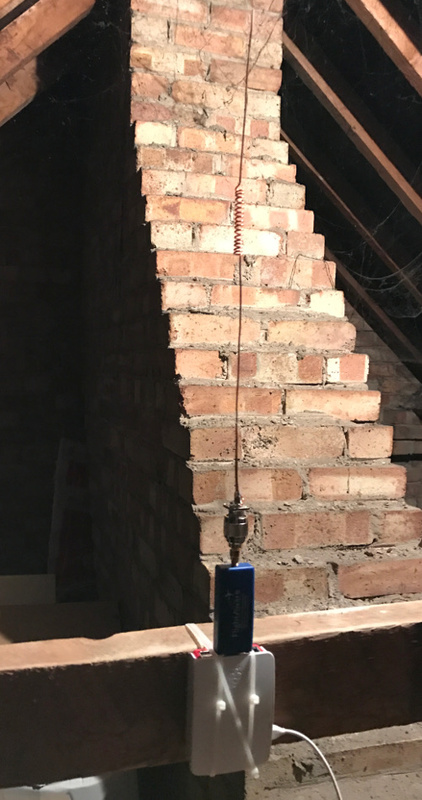 The second station is a homebrew aerial, a two element J-Pole collinear which I made using an SO-239 socket and a length of enamelled copper wire. This is connected via a PL-259 to SMA adapter and then directly into the FlightAware receiver so there’s no loss whatsoever between the aerial and the receiver. It’s mounted in my loft and as you can see, it’s quite heavily blocked in a south-southwest direction. I’ve been running these two installations simultaneously for a few weeks and the results are interesting. 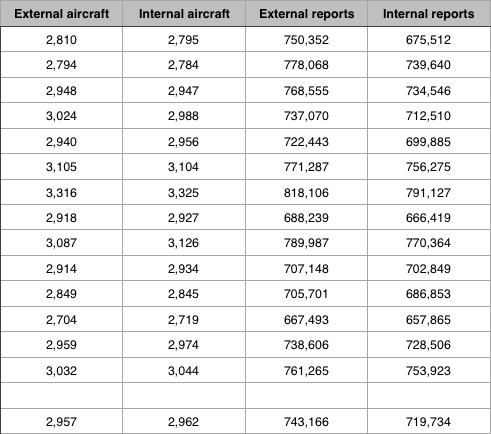 Here you can see the figures reported for the total number of aircraft received daily and the total number of position reports received daily. Here are the figures from the last two weeks. The first surprise may be the actual numbers. Yes, I really am seeing an average of nearly three thousand aircraft per day. That’s a lot! 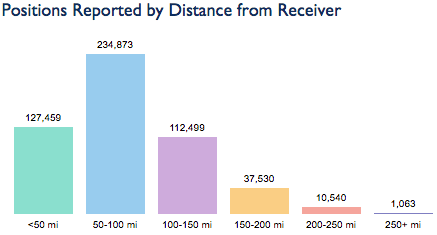 Perhaps more surprisingly, I’m seeing more aircraft on the internal aerial than the external aerial although the receiver attached to the external aerial is receiving more position reports per day. I know this isn’t down to either system being swamped by signals as I’ve run gain optimisation on each setup and they’re adjusted appropriately. 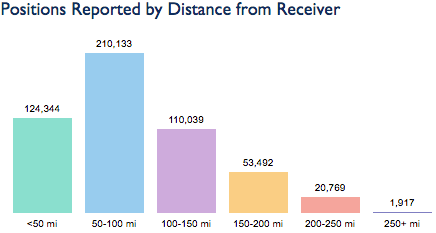 Another thing to look at is the variation in distances. Again, I think it’s surprising to note that I’m receiving a lot more signals from 150nm out using the internal aerial as compared to the external aerial. Finally, it’s worth looking at the heat map for each setup. This shows the maximum range received in each direction. This is what I would expect to see. The external aerial is in the clear and has a good view to the horizon with no obstructions whereas the internal aerial doesn’t have such a good takeoff and is clearly blocked in a couple of directions. My conclusion to all this is that you don’t need a big external aerial, mounted really high in order to be able to see a lot of aircraft traffic. Because all the aircraft traffic is up in the air that means that everything you’re receiving is direct line-of-sight and apart from local obstructions, there’s nothing in the way. 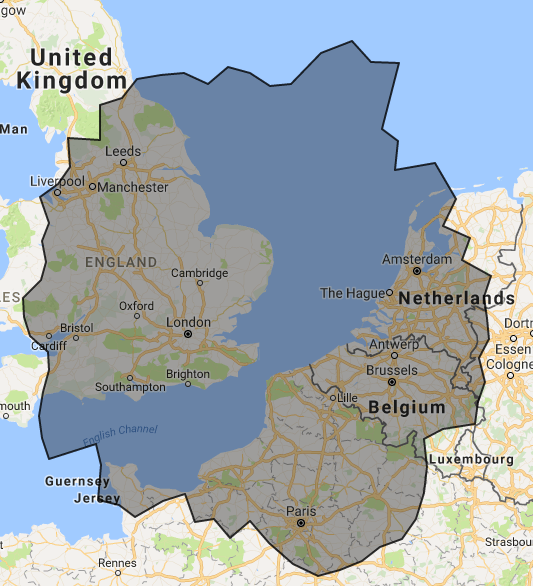 Of course, location is important and although I’m only 72′ above the sea, I happen to be in a prime location for spotting air traffic over the UK and north-west Europe. This entry was posted in ADS-B, Construction, Data, Raspberry Pi and tagged 1090MHz, ADS-B, Aviation, Raspberry Pi. Bookmark the permalink. This is a rather late reply to your post, which I just read. Interesting results. I used to live not too far from you in Suffolk, I had a radarama 5/8th antenna on top of a 60 foot tower with a masthead amp and about 100′ of UR67 co-ax feeding an SBS1er. 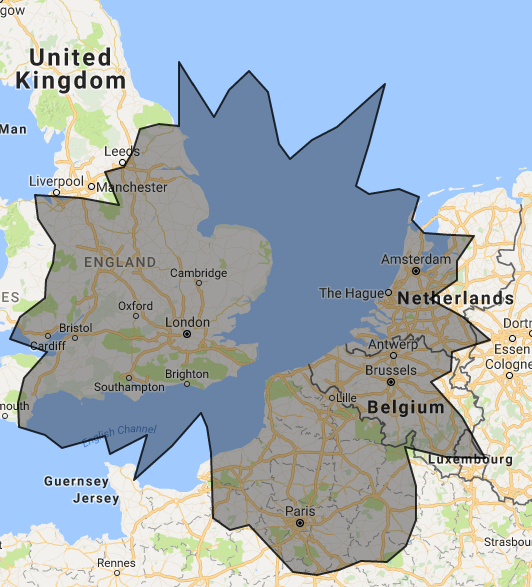 My heatmap was similar to your outside one with the maximum range to the East over the Dutch/German border typically 22,000,000 reports per day.